If there's one thing Republicans in Raleigh are good at, it's thinking up new ways to grab more power and then to keep it. They've been thwarted over and over by court rulings that find many of their power grabs unconstitutional. So what to do? Change the courts, and they've got new court-packing laws wending their way through the General Assembly right now. They intend to deprive the governor of his ability to appoint special superior court judges and new judges to vacancies on district courts. Who are they proposing to give the appointment power to? Why, to themselves, of course! More pernicious, they intend to shrink the size of the NC Court of Appeals from 15 to 12, explicitly to prevent Governor Roy Cooper from making appointments for three Republican judges who have mandatory retirements coming up during his first term. The proposed court-packing bills are all the work of this man, Rep. Justin Burr, who represents Stanly and Montgomery counties. In a party full of power mad manipulators, Burr stands out as exceptional. 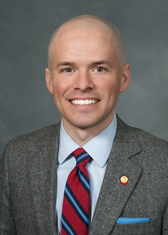 The NCGA's own Lex Luthor.